Contributions are part of new 30-year license for the Keowee-Toxaway Hydroelectric project. CHARLOTTE, N.C., Dec. 29 /CSRwire/ - Duke Energy will invest nearly $1.4 million to help protect wildlife habitat and land conservation efforts in South Carolina for many years to come. $618,000 to the Oconee County Conservation Bank to support regional land conservation and habitat preservation efforts. $762,000 to the Foothills Conservancy Program to administer the Keowee-Toxaway Habitat Enhancement Program (KTHEP). KTHEP funds support projects that create, enhance and protect fish and wildlife habitats along the shores of Lake Keowee and Lake Jocassee, as well as in their watersheds. 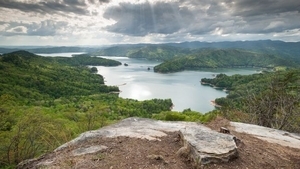 In addition to providing power to the region, Lake Keowee and Lake Jocassee have provided sanctuary for wildlife and helped drive the economy through tourism for many decades. These contributions are a result of the Keowee-Toxaway Relicensing Agreement Duke Energy entered into with 16 other stakeholder organizations during the Keowee-Toxaway Hydroelectric Project Federal Energy Regulatory Commission relicensing process. "Our board is proud to accept this gift from Duke Energy to help further the worthwhile purposes of the Oconee County Conservation Bank (OCCB), including the conservation of natural resources, wildlife habitat, clean air and clean water," said Shea Airey, chair, Oconee County Conservation Board. The new 30-year license for the Keowee-Toxaway Hydroelectric project, which took effect Sept. 1, 2016, represents a culmination of nearly a decade of collaboration among governmental and community stakeholders. Other benefits of the license include improvements to existing public recreational areas on Lake Jocassee and Lake Keowee, and conservation of approximately 2,900 acres of property adjoining the lakes to preserve and protect ecologically and culturally significant resources. "Receipt of the new operating license allows us to move forward with the plan developed during the relicensing stakeholder process. These contributions are key elements of that plan and we are pleased to invest in efforts that will help protect and enhance the natural environment in this region for generations to come," saidSteve Jester, Duke Energy's vice president of water strategy, hydro licensing and lake services. "These investments also benefit citizens and millions of visitors who travel to the area each year." The Keowee-Toxaway Hydroelectric Project begins with Lake Jocassee in North Carolina and South Carolina. It flows into Lake Keowee, then downstream to the Army Corps of Engineers' Lake Hartwell Project. The project is made up of two reservoirs with two powerhouses, spans approximately 25 river miles and encompasses approximately 480 miles of shoreline.